Much like it takes leaving the United States to remain appreciative of all that we as a nation possess, the same goes for South Africa. Even though it is very possible to live a comfortable first world lifestyle in ZA, there are always those differences stemming from our diverse cultures. Dealing with the target on your back in ZA as a white person, never mind a tourist or an American, is quite different from most other nations. The lack of Internet access, which my iPhone and job at Apple have made such a necessity, plus the craziness on the roads that seems to be ‘proudly South African’ can lead to a dissatisfaction upon arrival. The fact that my first few days in country were troubled with a lost airline bag, and food poisoning, my return to South Africa had been far from pleasant. However, two weeks in Mozambique with the beautiful chaos that is most of the continent brings my appreciation for ZA back to a all new high. 2 weeks of seafood had also been my limit and being able to grab a fast food burger at Steers (a local burger joint) was certainly needed to balance my diet. 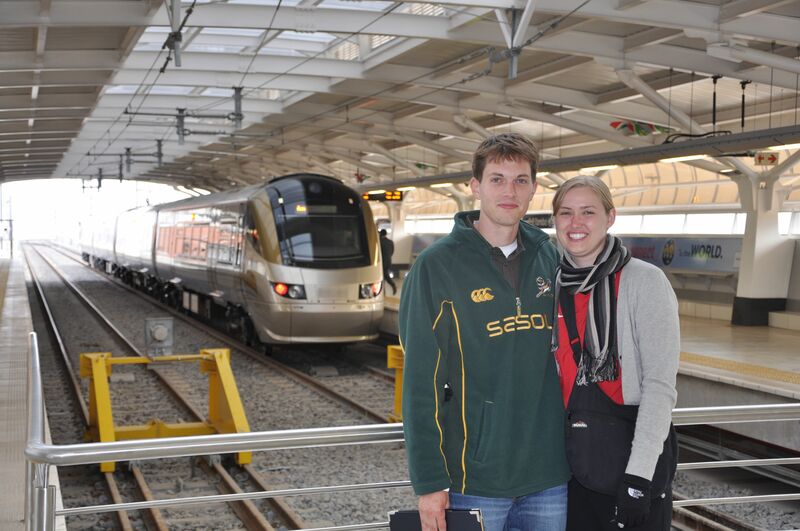 To take our delight of being back in ZA to a new high, we were taking the new Gautrain to OR Tambo from Sandton. The Gautrain (pronounced HOw-train) is a high speed train developed to help ease congestion in the Gauteng Province which is complicated by the New York City and Washington DC of ZA (Joburg & Pretoria) less than than an hour apart (though not with traffic). The Gautrain was conceived to connect the two cities along with then airport, and major business and residential areas (like Sandton). Delays plagued the project (it was supposed to be complete and up and running for the World Cup) but they were able to finish the Red line connecting Sandton and the airport in time and yesterday was the grand opening. This is a big deal for many local residents, as they feel they’re truly moving into the first world with a high tech transportation system that the affluent will use (most public transport in the country has historically been used by non-whites and thus a stigma is attached to public transit unlike most developed nations). Thus getting to ride this on the second day of operations was still an exciting time. As we went to buy our ticket (really a card much like a Metro Pass in DC that you reuse) there were people snapping pictures and numerous Gautrain personnel to assist in purchasing and getting you on the train. Which was quite an odd experience as they treated us like we wouldn’t know how to use a ATM like interface to load money and buy a card, but even funnier, they had people stationed at the entrances, in order to instruct you to place your card on the card reader and then move through the glass doors that parted. The fact that someone wouldn’t know how to move through with their card always brings back into focus the things that we take for granted in places like DC as something routine, yet someone who has never seen such a contraption might not understand how to move through the high-tech turnstile. Once on the Gautrain we moved quickly to OR Tambo, cutting a journey that takes an hour+ in Joburg traffic, in more than half. Moving at 160 kph, it was a great experience to be one of the first to travel on Africa’s first high speed train, one that could make a massive difference to life in Gauteng. help either. On the way home I was honked at and flipped off for driving the speed limit in the ‘fast lane’ of a two lane road in Sandton. Speed limit is a harsh term. Posted-numbers-on-circular-signs-that-have-no-correspondence-to-the-speed-of-drivers is a more accurate term. Back to Elna’s to do our Mozambican laundry and off to Sandton shopping mall to get last minute supplies and look for Bafana gear. Unfortunately for us, the 50th FIFA Congress was being held in Sandton, clogging up the streets more so than normal, causing a Mercedes to nearly take me off the road. This coming when we realized that even though there are turn lanes on city streets, this is in no way to suggest that cars cannot turn from other lanes. Upon crossing one road, we had a Mercedes SLK turn from a non-turn lane into our squeezing himself pass us with little disregard for the fact that my car was 1. already close to the car ahead of me and 2. that he would be wrecking his car if I didn’t stop in time. Luckily this all happened in gridlock, so all danger was negated, but the brazen traffic violations that locals take, and the look at me like I’m the idiot is shocking. How South Africans expect the meet the challenges of the coming decade when they’re killing themselves on the roads is hard to contemplate. The mall run was successful though, and we even got mirror socks for our car that are all the rage here to show our support for South Africa and also fly the Star-Spangled Banner. 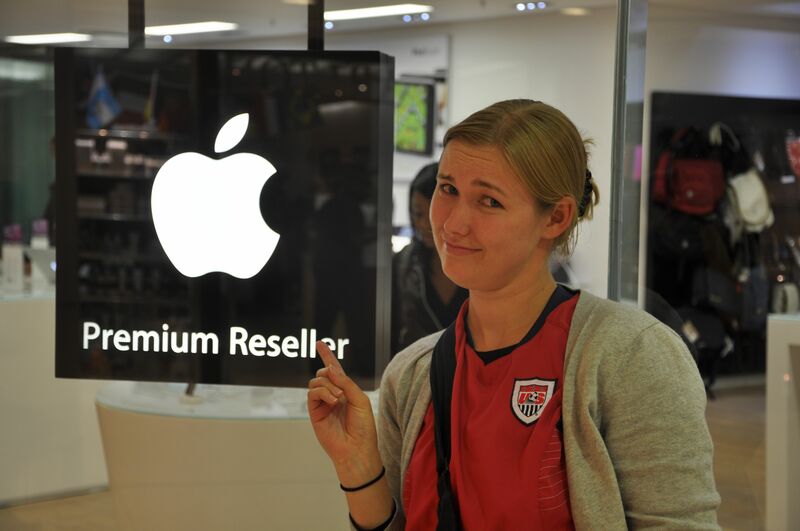 While perusing an iStore in the mall we were found out to be Apple employees and both offered jobs and work visas on the spot. No word on salary, but talk about culture shock, I can only wonder what its like to talk to people about Apple products in a place like South Africa. Would be a wonderful challenge. However, the owner/manager telling us that 15 customers in the store was a busy period due to all the foreigners made me wonder how time is passed is the ‘normal’ periods. I didn’t have the heart to tell him that it was never this slow at Pentagon City…. We make it to Moonlight around 2145 and have to track dow. The owners, in their living room of all places and are shown to the dorms and learn that we are the only people on the whole complex. Tomorrow is the day South Africans have been dreaming for the past 6 years to arrive, no idea where we’ll be to watch the match, but hopefully somewhere memorable. This entry was posted in Apple, South Africa, Travel, World Cup 2010 and tagged Apple, Johannesburg, Soccer, South Africa, World Cup by Alex Laverty. Bookmark the permalink.